Before we start using the dependency injection container in our code, we need a place to put our code. So, what we're going to do is create a module. We're going to call the module Blind D8. This is a terrible pun, but I think it's appropriate. Right? Because we're not exactly sure what we're getting into. We hope for the best, but we're kind of going into this blind. We're taking a look at Drupal under the hood. We're hoping what we see is positive just like we would on an actual blind date. So, this will serve as the structure in which we can create examples that tap into the dependency injection container and then the other parts of Drupal that are also built on top of Symfony like using events and creating our own services. 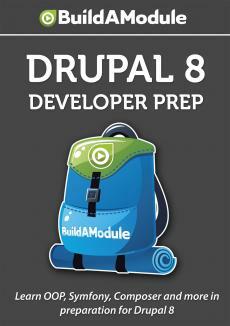 To start out, let's jump to our Drupal 8 installation. So, you may have your source directory open from your examples folder, but let's go ahead and go to the base folder of our Drupal 8 installation and we're going to create our module inside of the modules folder. Again, in Drupal 8 it introduces the really cool idea that you can create modules inside of the modules folder instead of inside of the site's all modules folder. So, we'll open up this folder, and we'll create a new folder called blind d8 - blind date. Now, as we go through this process, I'll explain some of the things that have changed since the initial videos in this series. Initially we used a snapshot of the development branch of Drupal 8, and there have been a few things that have changed since then.